Welcome to your prettier inbox! Thank you for opting into my email newsletter. In the footer of this email you can easily change you preferences or unsubscribe at any time. Remember I mentioned I’d be offering some of my designs for sale here first, well today I have one of my personal pieces up for sale. My Creamsicle corset was worn by me for a few events and then has been worn for 2 recent photoshoot with Laura & Rhawnie coming in to show off the beautiful shaping. I’ll share a bunch of photos of this corset modeled by both these models at the San Jose Woman’s club (75 S. 11th Street, San Jose, CA 95112), where my workshop & showroom are located upstairs. If you haven’t visited and are local or visiting the bay area soon, get in touch and schedule a visit (laurie@tavan.com or 408 202-4179). This corset is based off a La Mode Illustre magazine pattern that I scaled for my body proportions. Here are the basic approximate flat measures for you to consider. Some other possibly helpful measurements. For those who can stop by, please get in touch and we can arrange an appointment for you to try on this corset. Here is a very recent flat shot, the shaping is deceptively straight since you can tell it is a very curve-ful shape on a body. When corsets aren’t made with the modern side seam you do not “see” the shape or curve potential when flat. This corset is in excellent used condition. I found one small spot which you can see nearby the third grommet up on the right side in this photo. This is the corset pattern this was drafted off of and is very similar in design except that I did not include garters or garter tabs. Those could be added. Stitching, lace, and ribbon detailing. I just received the perfect sized box for it in the mail today! Please get in touch for a shipping quote. 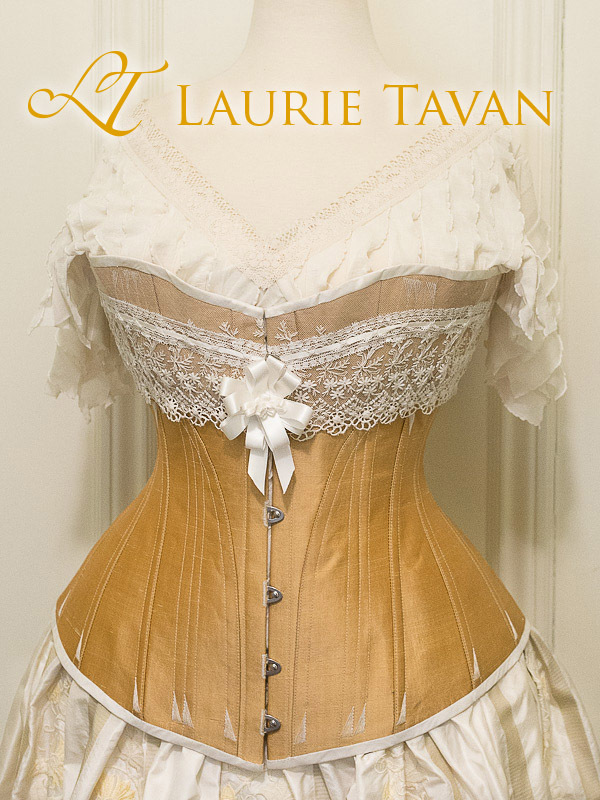 The corset is a nice pastel peach and not as orange as the final images in the tungsten lighting. I am offering this beauty at 50% of the price to custom commission something of a similar vein so get in touch if you are interested! This is a very special and ornate corset with a lovely dramatic shape. I’m asking $800 US plus shipping (sales tax for CA residents). I can take a deposit of $150 and two additional payments if you need a payment plan. I can accept paypal or take credit card payments through my invoicing system. And for those local to San Jose, I have this one and others for sale at the shop so please do get in touch to make an appointment to visit (laurie@tavan.com). Slowly but surely I’ll be measuring & listing my samples through my mailing list first. Sunday I will list this for general sale on my website if it has not been snapped up yet. The coordinating skirt is available as well for $200 US – embroidered silk. There is a sweet point for the height that depends on each body. Next story Dames a la Mode for the win!